-Discounted access to registrants and vendors alike at the 2019 NAC Concession & Hospitality EXPO which will be held on July 30 –Aug. 2, 2019 in our home base of Chicago in our 75th Anniversary year. Save the Date! -Substantial discounts for Operators and Suppliers at related industry shows such as CinemaCon, Show East, CineEurope, CineAsia and numerous regional shows that will literally pay for your annual NAC membership. -A Government Relations and Advocacy Program that informs members of the latest regulatory and legislative actions while partnering with fellow trade associations to inform and educate municipal, state and federal law-makers and regulators. –NAConline.org featuring a digital Membership Directory that links you with over 650 member websites and e-mail addresses. This service is exclusive to NAC members. -A weekly digital E-Newsletter that addresses topical concession news and NAC information. -A new Regional Seminars featuring “Building and Energizing Results Oriented Relationships”, an educational experience for all levels of management. -Complimentary Job and RFP Listings at www.naconline.org. -Registration discounts for all Certification and Education Programs offered by NAC. 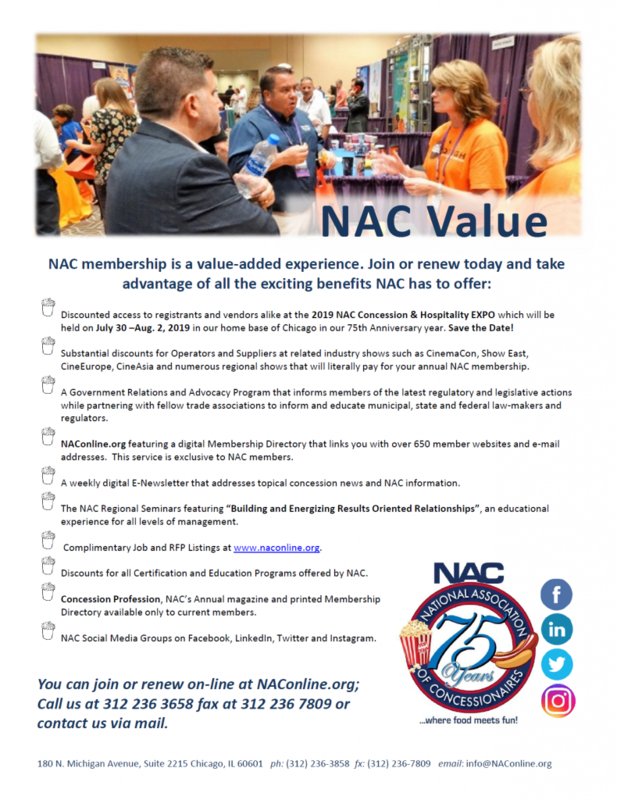 -Concession Profession, NAC’s Annual magazine and printed Membership Directory available only to dues paying members. -NAC Social Media Groups on Facebook, LinkedIn, Twitter and Instagram. You can join or renew ON-LINE at www.naconline.org; fax at 312 236 7809 or contact us via mail.